The dollar amount of venture capital (VC) investments in the solar power sector dropped sharply in 2013, but public market financings, large-scale project funding and mergers-and-acquisitions (M&A) activity jumped sharply higher, indicative of mainstream investors’ increasing level of confidence and a shift in government policies and incentives in key markets around the world, according to Mercom Capital Group’s Solar Funding and M&A 2013 Fourth Quarter and Annual Report. Investors’ growing interest in downstream solar (integrators, developers, leasing and installation companies) was apparent in the U.S. market. Downstream solar investments accounted for 45 percent of total VC solar funding last year, garnering a total of $262 million spread across 34 deals, up from $269 million over 26 deals in 2012. Another 3.34 billion was invested in 22 U.S. solar residential and commercial lease funds, 69 percent more than was raised in 2012 when $269 million was raised via 26 deals. Vivint Solar, SolarCity and Sunrun each raised well over $600 million in capital, with Vivint raising some $740 million from an undisclosed group of investors. Nearly $1 billion was raised in 4Q alone, Mercom’s report authors noted. Breaking VC solar investments down further, $104 million was invested in concentrating solar power (CSP) companies across 17 deals. That compares with $146 million in 15 deals in 2012, a 25 percent decline in dollar-amount invested. A total $104 million in 17 deals was raised by PV companies as compared to $114 million in 17 deals in 2012, an 8.77 percent decline. Investment in thin-film companies dropped the most (77 percent), totaling $72 million last year as compared to $314 million in 2012. Also highlighting activity in solar energy in 2013, more than $1 billion was raised in seven solar IPOs. In all, public market solar equity financings totaled $2.8 billion spread across 39 deals. That’s more than triple 2012’s total, which came in at $893 million across 23 deals, and $1 billion in 13 deals in 2011. Solar debt financings totaled $6.2 billion in 38 deals as compared to $6.9 billion in 34 deals in 2012 and $20 billion in 41 deals in 2011. China Development Bank was the single largest provider of solar debt financing, extending credit to five Chinese solar companies, some of the largest of which have been fighting to avoid insolvency and bankruptcy. 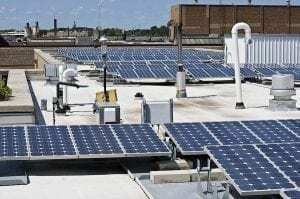 Funding for large-scale solar projects also surged higher, with Mercom tracking 9 gigawatts (GW) of new large-scale project announcements in various stages of development as of 4Q. Some $13.6 billion in 152 deals worth of large-scale solar projects were financed in 2013, a jump of over 56 percent from $8.7 billion in 84 deals in 2012. Activity in 4Q, at $6 billion in 46 deals, was the highest since 2010. 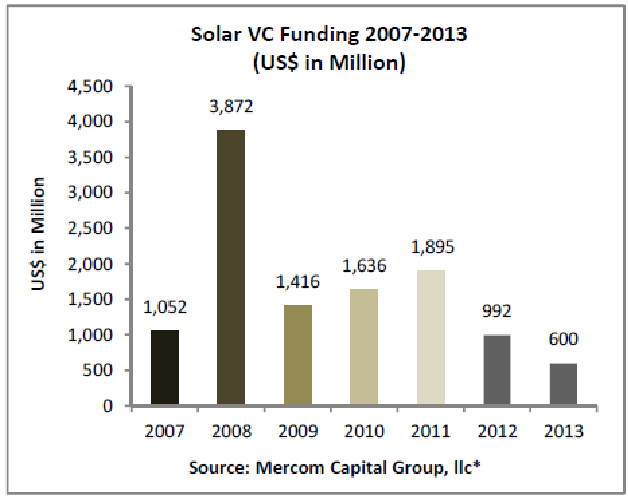 The U.S., far and away, continues to be the predominant market for solar VC funding. U.S. VCs accounted for $432 million of a total $600 million (72 percent) in VC solar funding in 2013 and 68 of 97 transactions (70 percent). 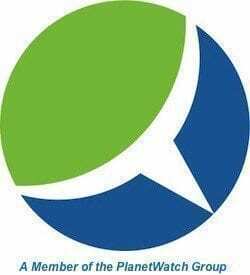 Mercom recorded 97 VC investments totaling some $600 million in the solar sector in 2013, around 40% less than 2012’s total of $992 million. The deal count dropped just 8 percent year over year, with an average size of $6.2 million, down from $9.6 million in 2012. Average deal size has been falling steadily since peaking in 2010 and 2011, according to Mercom. Solar M&A activity was nearly 90% higher year over year in 2013, totaling $12.7 billion across 81 transactions, according to Mercom, up from $6.7 billion in 51 transactions in 2012. Deal activity jumped 60%. On the downside, 28 solar companies field for insolvency or bankruptcy in 2012, with PV manufacturers being the most numerous at 18. Overall solar insolvency and bankruptcy filings were down 12 percent from a peak in 2012.